The Dark Ranger: Goon Match at the Home Opener? Will Orr get taken to school by the Boogeyman? Goon Match at the Home Opener? Will Orr get taken to school by the Boogeyman? Two season ago Colton Orr left NY for Toronto for that eternal optimism of Leaf fandom... Smug and secure he had made the right decision minutes into free agency when looking at his older, slumping, often injured pug faced replacement. Many of us cursed the management for not jumping at the chance to retain our resident knockout artist, but the truth is Colton Orr was not thinking about staying, he wasn't waiting or negotiating. Fast forward - This season, there's a new sheriff in town. He's paid more than the most knuckle-draggers in the game and that causes some concern for some Blueshirt fans for the minutes he'll play... 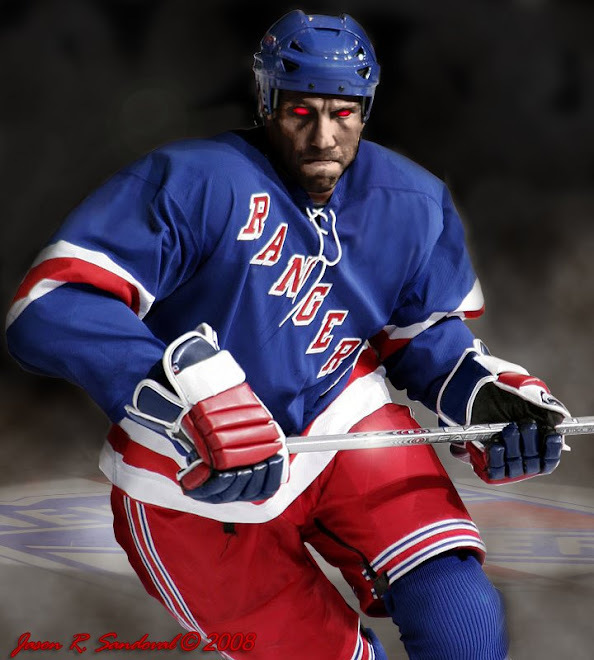 But Derek Boogaard, if nothing else, has what he needs to patrol the ice at the garden. In fact with the exception of one year (last year) his tenure in the NHL has been spent looking out for one man, if no one else... Marion Gaborik. Outside of the hockey fight school he runs with his brother in the off-season, the Boogeyman has had some difficulty finding a dance partner ... especially in the preseason and the first 2 season games. That could be attributed to his limited ice time or the fact that many guys (like Leblonde out of Jersey) suddenly remember a promise they made to their mothers not to fight, when paired up with Boogaard outside the face off circle. Even at -30 lbs this season at the insistence of Torts, Boogey is still bares a striking resemblance to an Cadillac Escalade in a Rangers jersey. While many have trouble finding their spines when confronted by Boogaard, Orr's never been one to back down from a fight. 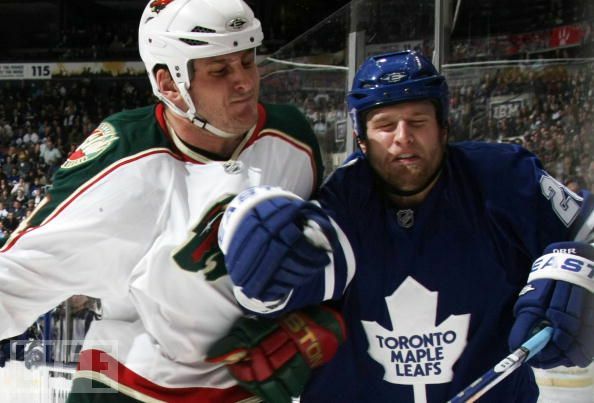 In fact when they met in the Juniors, it appeared that Orr may have even gotten the better of the scrap. That was then though and this is now. Orr's a real tough guy and he'll be forever endeared to our hearts (well mine anyway) for splattering Fedoruk across the ice to send a message and for cross checking Ovie the kneecapper in retaliation, and folding him like a cheap suit in that game against Washington years ago... That being said, dare I say Colton's could be already on the slide. He hasn't seemed to elevate his game at all and wins as many fights by chucking bombs with bravado and reckless abandon...as losing as many on strategy as he has in the past. That always limits the longevity of an enforcer's career. It shows as Orr was apparently KTFO'd (Knocked the Fu... well you get the picture) earlier this week by some kid out of Pittsburgh that out-chucked him, so to speak, and landed a chin-checking sledgehammer right on the button. I'm glad you pointed this out. ONe point not raised is whether or not Tortorella allows what the Garden has been asking for during the pre-season and the last two games. Former coach Tom Renney would put Boogey in the starting lineup -- which you can guarantee Brian Burke will put Orr in the starting lineup --- and LET 'EM GO AT IT. For both's sake, and mostly for Boogey, both want the affection of the NY Faithful. Even Orr. Enforcing Legacies are hard to come by and mostly forgotten, except for the one or two every generation, and tonight could be/will be one of those defining moments for both their careers.